New titles for April's Xbox Games with Gold selection bring games like Star Wars Battlefront 2 and Ghost Recon: Advanced Warfighter 2 into the mix. April's Games with Gold for Xbox One and Xbox 360 are here, and there's a wide selection of games for players to uncover this coming month. Titles like The Technomancer and Outcast: Second Contact will be up for grabs on Xbox One, while Star Wars Battlefront 2 (no, not that one) and Ghost Recon: Advanced Warfighter 2 will be available for Xbox One and Xbox 360 players as backwards compatible titles. Games with Gold has a unique selection coming next month, what can we say? The Technomancer puts you in the role of a mage warrior who's feared and respected by all. You can develop four different combat skill trees with different fighting styles as you craft new weapons, take part in dynamic conversations, and set out to explore lost cities. It sounds like an intriguing adventure that we haven't admittedly heard much about. Meanwhile, Outcast: Second Contact is a remake of a cult classic title that is credited with kicking off the open-world action-adventure genre. Explore an alien world called Adelpha as you dabble in magic and science white trying to make the right choices to save two universes' destinies. You're likely already familiar with Star Wars Battlefront 2, but just in case, this multiplayer title lets you play the campaign of a veteran clone trooper or take it on the road with different gameplay modes spanning 16 locations and various different characters. Lastly, Ghost Recon: Advanced Warfighter 2 is a tactical shooter that has you commanding units and finishing up missions in dynamic weather conditions, with 72 hours to defeat your enemy in different locations. 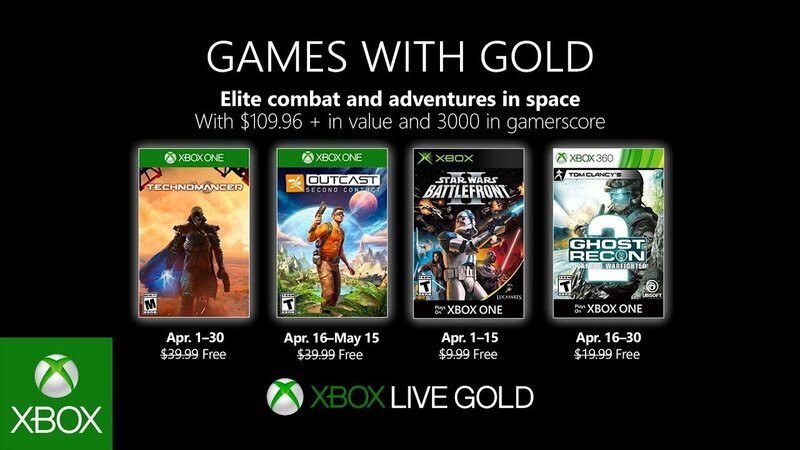 Make sure your Xbox Live Gold account is active and ready, and you can dig right into all these titles available this April.